When Munster dismantled Castres on January 21 the prospect of facing Toulon in the Champions Cup quarter-final of the Champions Cup was one to relish but injury woes and an upturn in form for the French side has changed things. Since that facile victory over Castres, Munster have lost Tommy O'Donnell, Chris Cloete, Chris Farrell, Tyler Bleyendaal, Jaco Taute, Keith Earls and Duncan Williams and Johann van Graan is sweating on the fitness of Simon Zebo, Andrew Conway and Rory Scannell. The centre issue is heightened by the fact that Mathieu Bastereaud was in fine form for France in the Six Nations and the big-spending French side have also brought in former All Black Malakai Fekitoa. The form of free-scoring full-back Chris Ashton will also be a concern. Speaking on Off The Ball on Newstalk, former Ireland head coach Eddie O'Sullivan said if the southern province can emerge victorious this weekend it would be an incredible feat. "I think if can Munster pull off this it'll be a phenomenal achievement," he said. "I don't think they can beat up Toulon up front but I think they have to play it tight. "If it's a messy day, we have the best scrumhalf in the world to put pressure on their back-field you can put pressure on them and upset them. "I think the fact that they won 49-0 at the weekend (against Clermont) is not a good thing (for Toulon). "The danger is that they come in and feel that they only have to show up against Munster. Great, if they do that. They might underestimate Munster somewhat. "They've had a big win and feel very comfortable in their skin and that's when you're at your most vulnerable in rugby. "If we attack through the midfield, the problem is Bastareaud and Fekitoa, if they get over the ball they are very strong. "You have to be very careful where you attack the midfield and how you attack the midfield. "I just think it's a huge ask for Munster at the moment. If Munster were in the whole of their health and everyone was on deck and they were firing on all cylinders, I'd fancy Munster. 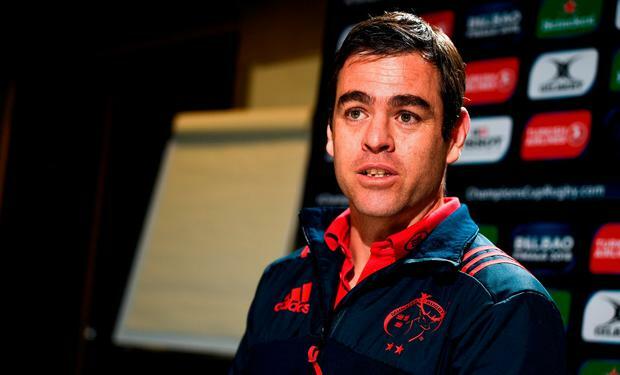 "I think at the moment they have been very unfortunate with injuries and they haven't really played together as a team, the key guys O'Mahony, Stander and Murray have been away for two months and that is another big challenge for Van Graan."